An island of spectacular scenery, fascinating history and a rich cultural heritage, Mallorca offers endless possibilities for exploration, days out and discovery. One of the most perfect destinations for a holiday! All of these destinations are just a few suggestions of things which can be seen and done across the island. Let’s not forget the traditional stone built villages which are waiting to be explored, such as Pollenca. There are also many Roman and Moorish ruins to explore, alongside the magnificent Tramuntana mountains which are a stunning World Heritage Site. Read more about Mallorca's points of interest below. Located on Mallorca's northeast tip, Cap de Formentor is a rugged peninsula that thrusts out into the ocean, offering spectacular views, quiet beaches and an altogether different atmosphere from the rest of the island. You can take a rewarding 20-kilometre drive from Port de Pollença, which provides the opportunity to enjoy a challenging drive, remote and dramatic scenery (such as high cliffs and craggy rock formations), and plenty of wildlife. The road reaches the viewpoint of Mirador des Colomer six kilometres beyond Port de Pollença – and there are fine views of a rocky islet offshore. 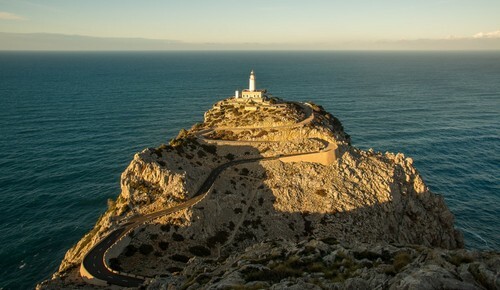 A nearby path takes you to an old watchtower from which you can see the whole of the Formentor peninsula, as well as the bays of Pollença and Alcudia.The road continues through pinewoods and through a tunnel beneath a mountain, ending at a lighthouse, where there are views all the way to Menorca if visibility is good. It’s worth stopping at the newly refurbished Hotel Formentor, which has been served a rich clientele since 1929. 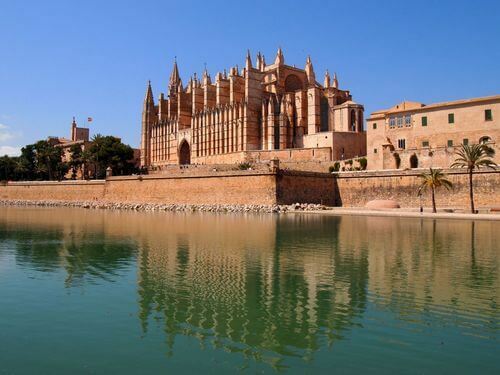 Palma is Mallorca’s capital, and one of its must-see buildings is its Gothic La Seu Cathedral. Built of golden sandstone, it glows in the sun and seems to soar effortlessly into the blue Mallorcan skies. Work on building the cathedral started in the early 13th century, and the building was constructed on the former site of Palma’s only mosque, commemorating a time when the Moors occupied Spain and the Balearic Islands. Work continued on the cathedral for 400 years - and was re-started in 1851, after an earthquake destroyed the West Front. Later additions were added more recently by the celebrated Catalan architect, Antoni Gaudi, whose stunning architecture provides a number of famous landmarks in Barcelona. The interior of La Seu Cathedral is a masterpiece, with light pouring through a huge rose window 12m across, which is studded with 1,236 pieces of stained glass. There are also fascinating interior works by Gaudi. Located at the geographical centre of Mallorca, the town of Sineu is famous for its weekly market, which includes livestock, plus a wonderful fruit and vegetable market, selling fresh produce grown on the island. Look out for local tomatoes, olives, oranges, dried figs and apricots – plus wonderful fresh flowers; there are also stalls selling great gifts, such as leather goods, lace, local pottery, basketwork and pearls. Local restaurants (especially those located in cellars) are a favourite of local farmers on market day, and they’ll welcome you when you join them for a late breakfast or lunch. Then, if you fancy some cool, cerebral culture as a contrast to the bustle of the market, investigate S'Estacid, a fascinating modern art gallery based in the old station. 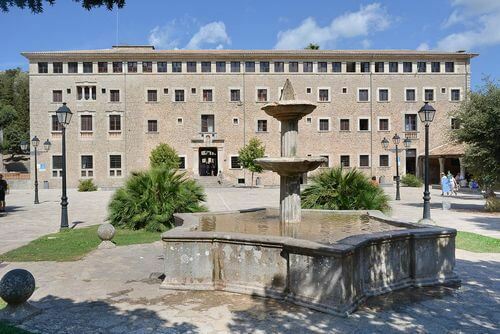 In fact there are a number of historical buildings in Sineu worth visiting, including the Town Hall, formerly the Convent del Minims (founded in 1667), which has impressive Baroque cloisters. 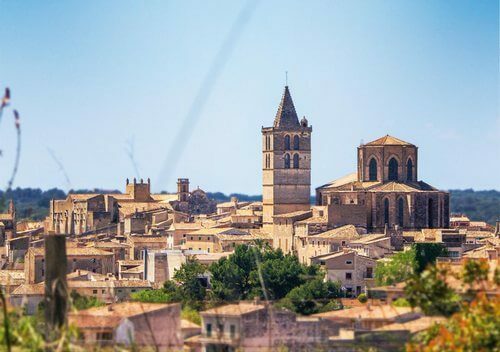 Sineu hosts events throughout the year, including one of the oldest Spring Fairs in Mallorca (established in 1318) held on the first Sunday in May. The 15th August is another big festival day for Sineu. The Botanical Garden near Soller is testament to the island of Mallorca’s amazing climate, which is perfect for the cultivation of so many exotic shrubs, flowers and trees. You’ll find them in abundance at the Botanic Garden, which is located on a country estate called ‘Camp d’En Prohom’, where they work hard to to preserve rare and endangered plant species under threat in the Balearic Islands, as well as building and conserving one of Spain’s most extensive wild flora seed banks. 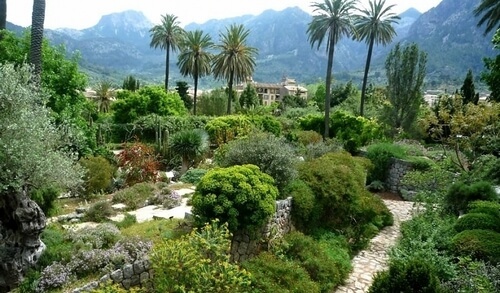 The Botanical Garden of Sóller are planted out in distinct sections, which helps visitors to understand and appreciate such a vast gathering of diverse greenery – and you’ll find categories such as Flora of the Balearic Islands and Flora of Other Mediterranean Isles, including Corsica, Sardinia, Sicily, Malta and Crete. There is also an ecological farm, an orchard, plants for medicinal purposes, and aromatic plants. The Museum of Natural Sciences is also located in the gardens. Botanicactus has established itself as one of Europe's largest and most significant botanical gardens, with an amazing variety of plants growing within its cool and leafy environs. Of particular interest are its impressive collections of bamboos and palm trees, as well as tropical plants that grow in abundance round a lake in the grounds. Botanicatus also grows dozens of varieties of cactus, which can take many years to reach maturity. 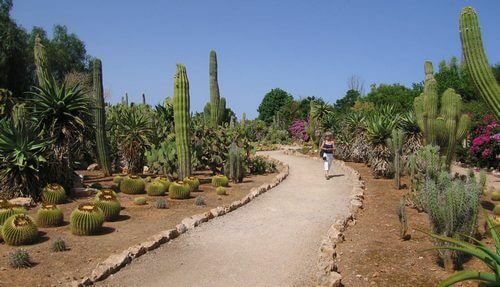 The gardens were opened in 1989 – and Ses Salines was chosen specifically because of the scarcity of rains in the area. As a result, the cacti flourish in the dry and sunny climate, and the landscape includes raised terraces, which have been specifically designed and placed to protect the plants from strong winds..
A spectacular cave system deep underground, the caverns known as the Cuevas del Drach are a captivating visitor experience, and take you into the heart of an amazing underground world full of space, colour and extraordinary rock formations. There’s a guided tour, which takes about an hour, and covers a distance of around 1,200 metres. The journey includes a boat trip across an underwater lake, and you’ll experience the sounds of classical music played live, creating extraordinary aural effect in their cavernous surroundings. 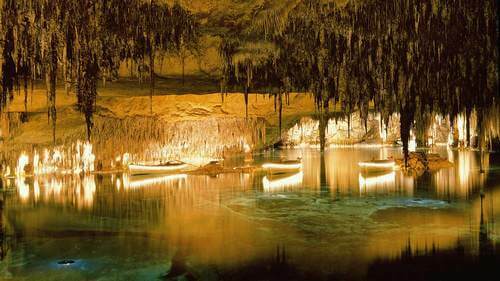 The temperature inside the cave system is about 21°C and the humidity is around 80%. The caves have been known to man since the Middle Ages, and they were thoroughly explored during the 19th century by various intrepid explorers. By the middle of last century, they were open to visitors, with the added reassurance of electric lighting! Palma Aquarium is a treat for adults and children alike, with a range of experiences that will delight the kids and captivate parents. For those who want to experience sea-life up close and personal, the Touch Pool allows you to touch sea creatures and learn about them by way of a totally interactive experience. You can also observe sharks and other sea-life from the safety and comfort of observation areas or from a glass-bottom boat. 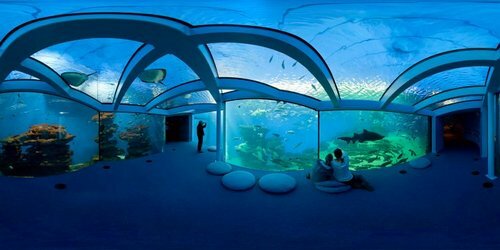 And, if you’re a fully qualified diver, you can immerse yourself in totally aquatic surroundings in ‘Big Blue’, the biggest shark tank in Europe. All the corals at Palma Aquarium are real, and the Aquarium is a leading world pioneer in the controlled cultivation and growing of rare-breed coral from all round the world. If you love the idea of combining art and nature tranquil surroundings, you’ll love this 15th century Mallorcan country estate and exclusive hotel complex - which is surrounded by beautiful gardens with paths winding through them, plus there are hidden corners for contemplation and relaxation – and everywhere you look there are absorbing works of art: sculptures, marble columns, ethnic artworks, installations and antiques, all designed to delight the eye and soothe the soul. In essence, the entire estate is devoted to the artistic expression of ‘Land Art’, in which art and landscape are viewed together to create a unique emotional response. Guided tours are available on request, and Art Nights plus gastronomy events take place regularly. Mallorca is full of secret places – if you know where to find them – and this wonderful beach at Cala Sa Nau is an idyllic place to escape to, free from crowds, distractions and noise. Simply head three kilometres north of Cala d'Or to this tranquil bay, which is surrounded by fragrant pine trees that create a green and fragrant backdrop to the beach. If you want to relax in decadent bohemian comfort, you can hire super-comfy bamboo sun-loungers – plus there are well-maintained showers and toilets to ensure that your visit to the beach is entirely comfortable and civilised. There is also an atmospheric and welcoming beach bar that sells drinks and snacks. You'll need your own wheels to get there, and car parking costs just €3.50 for the entire day. You can also take boat trips from the beach, for delightful ocean views of the coastline. 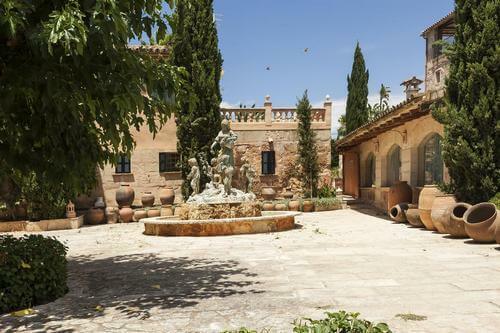 Without doubt, this is Mallorca's most sacred site - a former monastery in a spectacular setting in the Serra de Tramuntana mountains in Mallorca’s spectacularly rugged north west region. Lluc has been a centre of pilgrimage since the 13th century, with holidaymakers and pilgrims alike coming to pay their respects to a statue of The Virgin, known as ‘La Moreneta’ ('the Little Dark One'), situated in a chapel splendidly decorated with the arms of every town in Mallorca. There are daily concerts by Es Blauets choir (named after their blue cassocks), which was established in 1531 – and having sampled their soaring secular and sacred music, you can explore the monastery, which has a lovely rockery and botanical garden in the grounds. You can also stay at Lluc in total comfort, with all the 100 'cells' featuring en-suite bathrooms. Within the former monastic complex, there are several restaurants and bars, plus a fine museum. 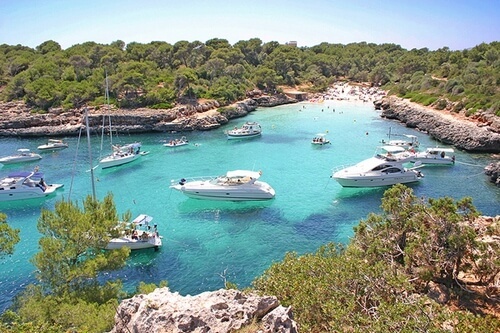 For more things to see in Mallorca visit here!